Swimming Pools require heating to bring it to a desired temperature during the swimming season, or to extend the swimming season in any climate, for swimmers to enjoy their pool virtually all year-round. 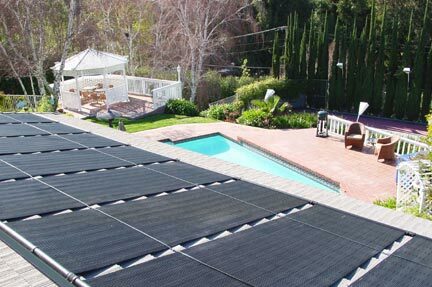 Solar swimming pool heating technologies first appeared in the 1970s and today’s solar pool heating systems are super-effective and very reliable. Solar pool heating systems have a lifespan of up to 20 to 30 years. There are many options available in the market to do so. But using the Sun’s power is much more economical & beneficial . There are numerous advantages of using Solar Power. Solar Energy Potential is almost infinite, with declining costs & no fuel and maintenance charges. It is environment friendly, does not lead to significant GHG emissions,does not lead to health hazards like thermal power. There is no danger of pollution and deaths. Solar Energy can be installed very quickly. Small residential installations can be done in as less as 3 days. This is much faster compared to other energy sources. Heating the pool through solar is the least expensive option. Gas fired units, heat pumps and oil heaters have huge installation cost & are expensive to operate. Gas and electric pool heaters, have to be replaced every seven to ten years. Electric Immersion heaters do not perform well outdoors, are expensive to install, operate and maintain. All of these heaters require annual maintenance, and possibly repair. Solar pool heating on the other hand is free and recommended by swimming pool builders. The solar panels can be fitted to the roof, laid on the ground or mounted on plywood. On the top and bottom of these panels are collector tubes (generally, pvc pipes), which distribute the water, and carry the solar heated water back to the pool. Water from the pool is channeled through the panels and is heated by the sun’s rays. The water is then returned to the pool by the existing pool pump. The system temperatures of 22º C to 41º C can be achieved. It is a very simple system which has greatly reduced the cost of utilizing solar heat for swimming pools. Standard pool solar collectors require a bank of panels equivalent to approximately 76% of the surface area of the pool depending on the geographical location. Ideally the bank should be angled at 15 to 45 degrees to the horizontal and be facing south. The distance between the filter pump and the panels must be taken into consideration when designing and sitting such a system. Given below is a list of swimming pool solar panels manufacturers. Note the list is not exhaustive. 1) Aquatherm Industries – is the largest manufacturer of solar pool heating systems in the United States & the only U.S. manufacturer of NSF listed solar pool heaters. Aquatherm manufactures several of the industry’s leading brands of solar pool heating collectors, including the Solar Industries and Ecosun collectors. The Ecosun collectors come in a wide range of 32 sq ft – 4’x8′, 40 sq ft- 4’x10′ & 48 sq ft – 4’x12′. Aquatherm, with its flagship product – the Ecosun Hybrid Solar Pool Heating Collector – is the leading manufacturer of in-ground and above ground solar pool heating systems. Aquatherm’s entire manufacturing process takes place at its 50,000-square foot technology center in Lakewood, NJ – the most modern facility of its kind in the world. 2) Enersol Solar – Established in 1979, Enersol lead the way in solar pool heaters. The company was the first to produce a modular solar pool heating system, for homeowner installation. The solar pool heater is very versatile and can be put anywhere the sun shines. Its products are durable and long lasting, low maintenance, resistant to pool chemicals, harsh U.V. rays, cold winters and the hottest summers. Enersol Solar Products come with an 18 Years Extended Warranty. These solar panels are very easy to install. Two people can install this system easily within 1 day. 3) Heliocol – Started in 1977, revolutionized solar pool heating by developing the world’s first collector with individual tubes. Heliocol systems do not require the maintenance costs associated with other types of pool heating systems. Heliocol panels are built to endure with a 12 year full warranty and a limited lifetime warranty. Pitched shingle roofs, flat roofs, tile roofs – any type of roof, with the appropriate sun exposure is suitable for a Heliocol installation. Heliocol can be easily installed on ground racks, patios or fences too. Because of Heliocol’s patented gap-less design, the system also allows for more square footage in a smaller area. 4) Hi Temp Solar Hot Water System – cost-effective, high value, high quality pool heating. There is no moisture build-up under collectors that could cause premature roof deterioration. Hi Temp’s design virtually eliminates wind load, making it ideal for windy provinces. The collector is easy to install and operate. Repairs can easily be done on-site. The products come with a 12 Year warranty. One can use a Hybrid system for pool heating, if he already has a gas or electric pool heater. This will save money and the environment by making free solar energy as the primary heat source. In the hybrid configuration, the swimming pool heater uses solar as the primary source of heat, and a gas heater or electric heat pump as a backup source. Since solar energy is free, this enables significant reduction in the operating costs. And by using less fossil fuel, a hybrid system has less environmental impact.